Though Tesla forecast it will soon be profitable and cash-flow positive, its timetable for Model Y production doesn't seem to be going over well. The same might go for Elon Musk's earnings call behavior. A disappointing production target appears to be once more weighing on Tesla's (TSLA - Get Report) stock and overshadowing an upbeat near-term profit forecast. 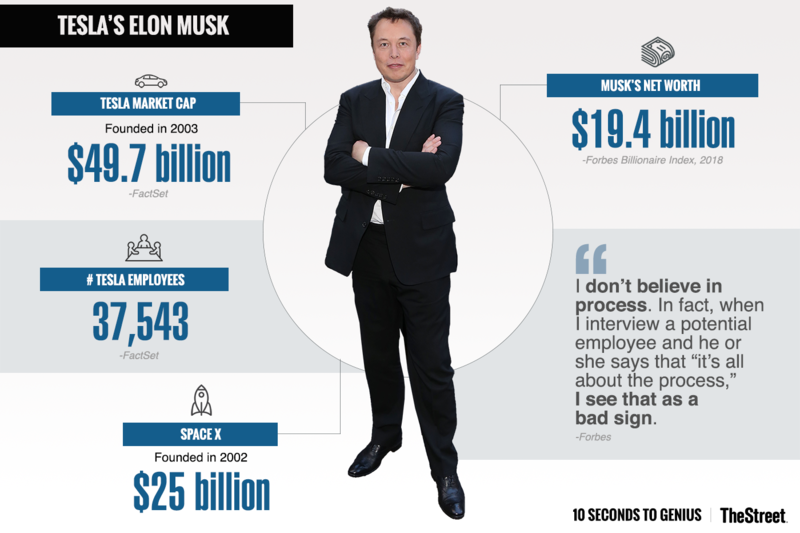 So might Elon Musk's demeanor on the earnings call during which the target was provided. After the bell on Wednesday, Tesla reported Q1 revenue of $3.41 billion (up 26% annually) and non-GAAP EPS of negative $3.35, beating consensus analyst estimates of $3.28 billion and negative $3.54. Revenue, it should be noted, got a boost from an accounting change that resulted in a smaller percentage of car deliveries being treated as leases rather than sales. Shares didn't initially move much post-earnings, fluctuating between small gains and small losses as investors digested the positives and negatives found within Tesla's Q1 shareholder letter. But they sold off, and eventually finished after-hours trading down 4.6%, after Musk indicated that production of Tesla's Model Y crossover won't start for another 24 months or so. And that when it does, it won't happen at its existing Fremont, Calif., plant, which Musk called "packed to the gills." On Thursday morning before the open, Tesla shares were down 7% to $280 in pre-market trading. An April Reuters report, which Musk declared to be "based on nothing," stated that Tesla has indicated to suppliers that Model Y production will start at Fremont in November 2019. Wednesday's remarks, which also included a disclosure that Tesla's decision on where the Model Y will be produced won't happen until later this year, suggest a production ramp won't start at least until the spring of 2020. Also potentially unsettling investors: Shortly before commenting on the Model Y, Musk flippantly dismissed a pair of analyst questions -- one related to capital needs, and one related to the percentage of Model 3 reservation holders who buy the vehicle once they're able to. He then proceeded to answer several questions -- including the one that led to his Model Y comments -- from Gail Russell, a Tesla investor who runs the HyperChange TV YouTube channel. With the qualifier that Model Y capital spending isn't expected to become "significant" until next year, it might not be a coincidence that the Model Y comments followed a Q1 report in which Tesla cut its 2018 capex budget: After previously forecasting 2018 capex would exceed a 2017 level of $3.4 billion, Tesla now expects it to be less than $3 billion. The company insisted its capex has become more efficient and that it has room to further cut its budget if needed. It also forecast capex guidance "will develop in line with Model 3 production and profitability." With the help of the capex cut, slower operating expense growth and a restructuring set for later this month, Tesla now aims to achieve both positive GAAP net income and positive cash flow in both Q3 and Q4 of 2018. These goals mesh with what Musk suggested in a recent tweet, and if Tesla hits them, it will have easily topped pre-earnings Q3 and Q4 analyst estimates. Prior to the Q1 report, consensus was for Tesla to post GAAP EPS of negative $2.28 during the last two quarters of the year, and to have free cash flow (FCF) of negative $832 million. It's worth noting that hitting the profit and cash-flow targets not only depend on weekly Model 3 production reaching a level of 5,000 -- Tesla is reiterating an early-April forecast that it will get there around early July -- but also on Model 3 gross margins (GMs) to improve rapidly, albeit at a slower pace than Tesla previously forecast. Model 3 GM, said by Tesla to be "slightly negative" in Q1 even though the company is only making the costlier Long Range version of the Model 3 for now, is forecast to be "close to breakeven" in Q2 and "highly positive" in Q3 and Q4. On the call, Musk added Model 3 GM will be "close to 20%" by year's end. Three months ago, the company was expecting to reach a 25% GM once Model 3 production "stabilizes" at 5,000 cars per week. The company blames its new outlook on a mixture of tariffs, a weak dollar, higher commodity costs and the hiring of additional workers as Tesla pares back its use of robots in the assembly process a little. Thanks largely to Model 3 margin pressures, Tesla posted a Q1 non-GAAP automotive GM of 18.8% -- a little better than expected, but down from a year-ago level of 27.8%. GMs for the Model S sedan and Model X crossover -- Tesla still expects to deliver 100,000 of them this year -- were "slightly above 25%." In addition to affecting the Model Y ramp, lower capex could impact how quickly Tesla reaches a previously-stated goal of eventually making 10,000 Model 3 units per week. At least getting close to that target is vital for a company still trying to work through a massive backlog of Model 3 reservations. On Wednesday, Tesla, which previously said that Model 3 net reservations totaled 455,000 around the time of the car's late-July launch event and had risen "significantly" in the following weeks, said that net reservations "continued to exceed 450,000" at the end of Q1. That suggests at least a subset of reservation holders are getting impatient. And while Tesla reiterated its goal of eventually making 10,000 Model 3 units per week, it now adds it wants to do so by incrementally adding capacity "in a capital-efficient manner." Clearly, there's a price attached to Tesla's newfound interest in quickly becoming profitable and cash-flow positive, and thus avoiding another capital raise (Musk stressed on the call that he doesn't want to do one). In exchange for not seeing a dilutive stock offering or a debt raise that would further stress a balance sheet with over $8 billion in net debt on it at the end of Q1, Tesla seems to be willing to accept slower production ramps for its low-cost sedan and perhaps also its upcoming low-cost crossover.